It is winter as I write, and over much of the ABA Area—and well south into Middle America, too—there’s a good chance that your eye will come to rest on a member of one of the most familiar of all American sparrow genera, the juncos. Every birder, even those of us with regular access to only a single junco “kind,” will have noticed how variable these tame sparrows can be. The juncos of my New Jersey backyard, all of them presumably “just” Slate-colored Juncos of the subspecies hyemalis, show an astonishing range of plumages, from the slatiest of blackish (apparent) males to the warmest, softest of pastel-brown (apparent) females; occasionally a bird pops in with white wing bars or a hint of a white eye ring. All that pales, of course, when compared to the variability exhibited by juncos in the Midwest, West, and Mexico, where the birder might be forgiven for seriously wondering—just as scientific ornithology continues to seriously wonder—just how many species we’re dealing with. That physical variability is accompanied by a similar plasticity in behavior, sure signs that the juncos are especially quick to evolve in response to changing environments, and making of them ideal subjects for the investigation of speciation, physiology, and animal behavior. Ordinary Extraordinary Junco begins with the account of such an experiment from nearly 100 years ago, when William Rowan, a Canadian zoologist of cosmopolitan background and training, began a study of captive juncos that would demonstrate, for the first time, the role of photoperiod in triggering physiological changes necessary to the birds’ migration and breeding behavior. This is a fascinating and too little-known story, combining science with institutional and disciplinary history; the fact that it is told on screen by actors in period costume detracts only slightly from its significance. The ninety-minute video is divided into six chapters, each of which can be profitably watched on its own. That is not to say, however, that the sections are unrelated or that their sequence is unmotivated. The account of Rowan’s spare experiment on the cold plains of Alberta is followed immediately by a detailed report of the elaborate studies being carried out in the mountains of Virginia by a team led by Ellen Ketterson of the University of Indiana. Working with both captive and color-marked wild juncos over some thirteen years, Ketterson and her students and colleagues have deepened our understanding of the complex role played by hormones in social and parental behavior. By experimentally manipulating testosterone levels in male Slate-colored Juncos, the Indiana scientists have determined that those with higher levels sing more frequently, hold larger territories, and (thanks to an increased frequency of extra-pair copulation) produce more young. Those same males, however, also devote less parental care to their young, and themselves survive at a lower rate than juncos with normal levels of testosterone. These are findings whose significance goes far beyond a single species. The film’s central chapters address issues of evolution and speciation. Lovely video sequences showing breeding Pink-sided, Oregon, Gray-headed, and White-winged Juncos, along with the widely disparate habitats each occupies, introduce fundamental questions about the origins and complex relationships of these diverse populations, most neatly summed up by the footage of a mixed pair—a male Gray-headed and a female Oregon junco—in dutiful attendance on their hale and hearty nestlings. After a brief summary of Alden Miller’s work in the 1930s and 1940s (I would have been happy to hear Jonathan Dwight’s name mentioned in passing, too), Borja Milá of the National Museum in Madrid explains, clearly and cogently, how techniques for genetic analysis not available to earlier researchers now make it possible to reconstruct the evolutionary history of the juncos. Study of mitochondrial DNA has revealed that the ancestral junco was a yellow-eyed bird. That ancestor moved north with the receding glaciers less than 20,000 years ago, and rapidly diversified into the dark-eyed juncos we know today from northern North America, which, given their very recent and very rapid divergence, still differ only slightly from one another genetically. The film also offers a salutary and fascinating reminder that juncos are more than just the well-known dooryard snowbirds. The yellow-eyed juncos turn out to be much more distantly related to one another than are their various dark-eyed congeners among themselves. The soft-colored Baird’s Junco of Baja California, the olive-toned and relatively dark-tailed Guatemala Junco, and the “standard” Yellow-eyed Junco of the Mexican highlands and southwestern US appear to have gone their separate evolutionary ways half a million years ago, rather than the scant 10,000 marking the start of differentiation among the various dark-eyed populations. The research described in the film indicates that these three, wholly allopatric groups of “the” Yellow-eyed Junco are in fact best considered distinct species—a fact of considerable importance to nascent conservation efforts in the small, remote ranges occupied by the Baird’s and Guatemala Juncos. The rarest, most isolated, and most little-known of all the juncos is a dark-eyed group, surviving as a population of just a few hundred birds on Mexico’s Guadalupe Island, 150 miles from the coast of Baja California. Introduced livestock devastated Guadalupe’s forests and drove several of its 40 endemic plants and animals into extinction before the last goats were finally removed in 2007. The junco—brown, dull-backed, and strikingly long-billed—is once again reproducing successfully, but its population growth is, obviously, strictly limited by the extent of its habitat, today no more than 300 acres of dry cypress forest. Perhaps surprisingly, genetic analysis shows that the dark-eyed Guadalupe Junco is most closely related to the yellow-eyed Guatemala Junco; it is, nevertheless, sufficiently distinct genetically that Ketterson and Milá consider it, too, a separate species. 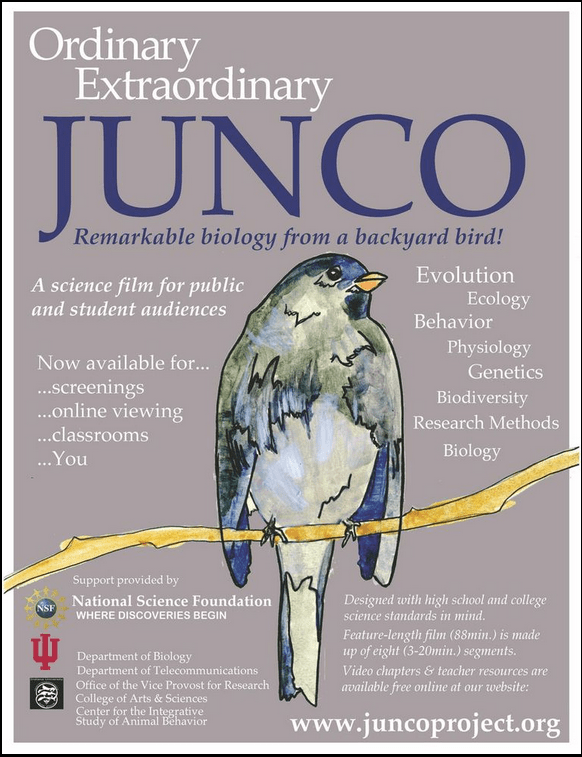 The final chapter in the film returns the viewer north of the border, to a university campus in San Diego, where Oregon Juncos of the subspecies thurberi established a breeding outpost in the early 1980s. Now totaling about 80 pairs, this isolated urban population has already diverged measurably from its mountain-breeding relatives in behavior, voice, and physical characteristics, providing an impressive window into evolution in “real time.” Thus, for example, the lowland colonists commence breeding earlier than their montane ancestors, and now produce up to four broods a year; the males have evolved to be less aggressive and more heavily invested in care of the young. In adapting to their bustling urban environment, the juncos have lost the shyness of mountain birds, approaching humans more closely and more readily exploring new situations. These novel traits, from shorter wings to lower stress hormone levels, have evolved with startling rapidity, over less than a single human generation. We are approaching the centennial of the first serious attempt to come to terms with the genus Junco in all its bewildering complexity. Little could Jonathan Dwight have imagined in 1918, or even William Rowan in 1924, how much there still is to learn today from a bird that is, indeed, both so ordinary and so very remarkable. – Rick Wright is the Book Review Editor at Birding and the ABA Blog. His forthcoming publications include the ABA Field Guide to Birds of New Jersey and the sparrows volume in the Peterson Reference Guide series. Wright, R. 2014. Juncos and Science [a review of Ordinary Extraordinary Junco, by Jonathan Atwell, Steve Burns, and Ellen Ketterson]. Birding 46.1: 75.